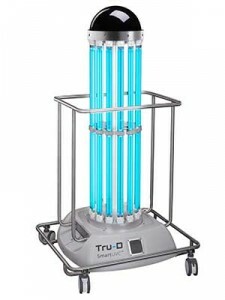 Tru-D SmartUVC is the only portable UV disinfection system that delivers an automated, measured dose of UVC light to consistently disinfect an entire room during a single cycle. Operating from a single position in the room, Tru-D ensures up to 99.9 percent pathogen reduction in direct and shadowed areas. Validated by more than a dozen independent studies, Tru-D’s automated, measured dosing capabilities and real-time usage-tracking features make it the most advanced UV disinfection system available.